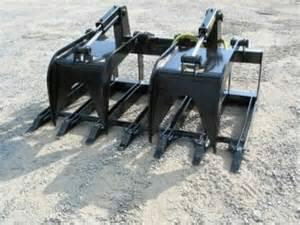 ROOT RAKE, SKIDLOADER ATTACHMENT HYD. SKIMS GROUND APPROXIMATELY 2-4 INCHES TO SIFT ROOTS AND ROCKS WITH GRAPPLE ATTACHMENT TO "CARRY" SIFTED ITEMS. wILL NOT PICK UP ITEMS MORE THAN ABOUT 4 INCH IN DIAMETER. * Please call us for any questions on our root rake skidloader attachment hyd. rentals in Hagerstown MD, Williamsport MD, Martinsburg WV, Waynesboro PA, Mercersburg PA metro areas.